Udi is cure of all diseases. This has been experienced by many and the following experience also says so. Sai Sister Sheena ji from UK says: Jai Sai Ram. Thank you Hetal ji for helping all the Sai Devotees all over the world. I feel extremely happy to see how Baba is helping all His children. I promised Baba that I will share my experience and here I am. I just want to thank Baba for all that He has done for me. Thanks Baba. Thanks for being there. Please publish my experience and do not mention my email id. My son is 6 months old and was suffering from bad cold for the past 3-4 days. He could not sleep during the whole day and night. The doctor also could not help as he said there is no such medicine for babies. Then I thought of the real doctor our Sai Baba. I prayed to Him a lot and read the Kashtnivaran Mantra as well. I promised Baba that if my son is well again and sleeps well through the night, I will share my experience in the blog and donate food and also will visit the temple. Then the night came, I gave my son a bath and applied UDI on his forehead, which I do every day. Before sleeping, I prayed to Baba that please keep your promise and I will keep mine. To my surprise, my baby slept well through the night and was feeling better. Though he is not completely fine, but I am sure with Baba's grace he will be well soon. I was really relieved. Baba helped me again as He always does. Thanks Baba for being so generous. We all love you Please be with us always. I have one more experience to share as well. I wanted to start my career as my baby was 6 months old and was not sure what to do. I wanted to get a job in my field, because I never wanted my studies to be wasted. I did not know what to do as I left work 2 years back and that too I worked in India. I was very upset. One day, I was going through the blog and then I read one experience in which Baba's questions answers book was mentioned. I opened the website and asked Baba questions regarding what should I do to get a job and the answer came donate food and then see the result. After that I asked how I will get a job, and then the answer came that a friend will be there for your help. I donated food and after 2 days, I got a random call from my old friend. He was working in UK. During the conversation he said that I can help you in getting a job. I had sent him my CV and he said that he will have a word with the people and he said he will get back to me. He has yet to come back but see how Baba's words came true. How he came and helped me. I am sure Baba will help me getting a job through my friend as He said in His answers. I lost my parents 2 years back and since then Baba is everything for me. I just want to tell all that Baba always worries for us like our parents do. Always thank Him for what He does and what He does not do. It’s all for our well being. Jai Sai Nath. We keep asking Baba for something or the other all the time .We humans do not pray without a slefish motive or for some gain or benefit . Why are we like this ? Why don't we allow Baba to do what he likes . This applies to everybody , including me . May Baba's graces be with every one ,let his will be done . like a child asks his parents to get a particular toy to play with, so baba's bhakts too ask Saimaa for something or the other. i dont think this is wrong as long as one is chanting baba's name and doing his karma with uprightness. Can any one upload sai-kashta-nivaaran-mantra in telugu. Baba Please excuse me Baba for my mistakes. with lots of endurance to face all types of difficulties. Om Sai Sri Sai Jai Jai Sai!!! Om Sai Ram. Please give me Shradha & Saburi to face all my problems. 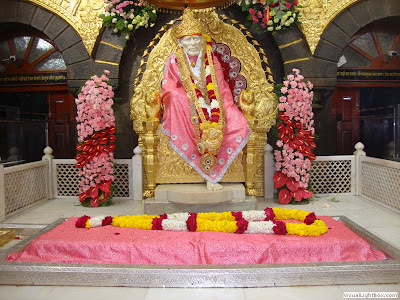 I have started visiting sai baba daily and i know baba will definitely fulfill my wishes.Believe him,let all ur fears in front of him and he will give you the solution.Remember, dont lose faith..None is bigger than GOD:)I Just need all ur wishes as well..